Susan and her family move from New York City to Missouri when the company he works for goes out of business in 1943. A small town in the South is a big change, and when Susan realizes that she won't be allowed to be friends with Loretta just because Lorretta is black, she is angry. Her friends Liz and Marlene think that this is fairly normal, just like the fact that black people can't go to the pool, movies or live in the same buildings as white people do. 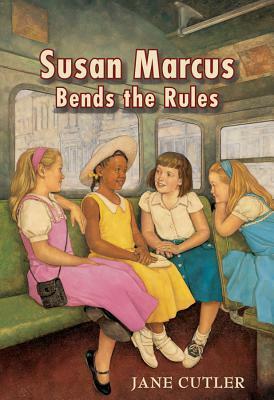 When Susan investigates, she finds out that the Jim Crow laws don't extend to the bus, and the four girls make plans to "bend the rules" and ride the bus together. Strengths: The real appeal of this book are the details about daily life at this time. The war affects each family in different ways, form Loretta's mother wanting to move to California to work in a factory to the rationing that causes everyone difficulties. There is a Chinese restaurant in town that is attacked because people think the owners are Japanese, and there are also descriptions of writing letters, skating, and other bygone everyday activities. The Civil Rights plot line is fine. Weaknesses: Holiday House's book formatting makes me not want to purchase their books again and again. 1980s style artwork, tiny font, and inadequate white space make these very unattractive. Really, clip art appeals more to students than drawings and paintings. The stories are not bad, but I can spot Holiday House cover art at fifty paces. Something like this (maybe with some color, now that I think of it, a 1940s green, perhaps) would almost be better.